Molly Roberts, assistant professor at the UC San Diego Department of Political Science, does not get easily intimidated. For the past seven years, Roberts has been devoted to the formidable task of understanding censorship in China—or, as she and her colleagues put it, ‘reverse-engineering’ censorship. Since joining UC San Diego in 2014, she’s leveraged the School of Global Policy and Strategy’s (GPS) strengths in the Asia Pacific and big data, including partnerships with its 21st Century China Program and Policy Design and Evaluation Lab (PDEL), to peel back the layers even further on Chinese censorship. She’s answering the question on many minds that is: What is the Chinese government trying to hide? 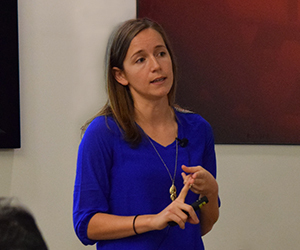 In a PDEL workshop on Jan. 27, Roberts presented to her faculty peers and graduate students what she knows so far. The project began when her Ph.D. adviser Gary King, Albert J. Weatherhead III University Professor at Harvard University’s Department of Government, came to her with a collection of millions of Chinese blog posts. Roberts, at the time fresh off earning her master’s in statistics from Stanford University, saw the collection as an opportunity to do what she enjoys most—use text as data. She worked alongside fellow Ph.D. candidate Jennifer Pan. Together, King, Pan and Roberts conducted a large-scale observational and experimental study of censorship. This entailed collecting more than 3 million social media posts from around 1,400 social media sites and downloading them immediately after posting, before they were potentially censored. Through a random sample of 127,000 posts, they found that the Chinese government censors during events with “collective action potential.” Surprisingly, the main focus is not criticism of the state. This first paper was published in 2013. In their subsequent paper, published in 2014 in Science, they conducted an experimental study of censorship, validating their conclusions from 2013. This project sought to address not only what was censored, but also how. As such, the team created its own social media website in China for a backend view of how the censors decided whether or not some posts even see the light of day. This notion that censorship has lasting impacts on Chinese citizens is what Roberts has taken on in her research that’s spun off from the initial project—first in her dissertation and more in depth in the book manuscript she is currently writing. She’s refined this research at UC San Diego through working with the 21st Century Program, specifically opportunities presented through its funding from the Carnegie Corporation of New York to work with Chinese academics. For instance, collaborating with a survey researcher from Tsinghua University, Roberts collaborated on a survey of Chinese people’s experiences with the Internet. Meanwhile, her connections at PDEL brought to fruition her connections at the San Diego Supercomputer Center (SDSC), including with Research Scientist Amarnath Gupta who has helped her further develop her databases. “One of the big challenges with this type of data is there is so much of it, making it difficult to do basic things such as keyword queries and download it in real time to analyze,” Roberts explained. The SDSC has smoothed out some of these challenges to the extent that Roberts now is moving forward with gathering data from around the world to understand how censorship incentives differ across countries.